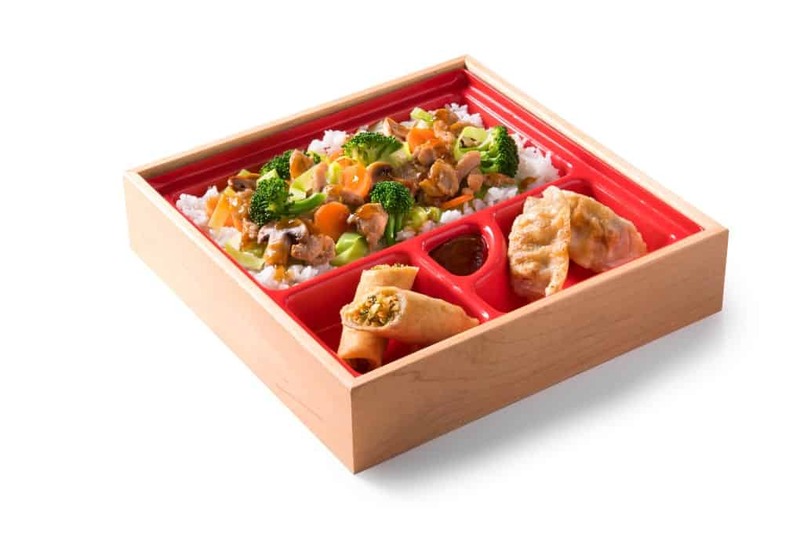 Edo Japan Celebrates New Bento Box Offerings giving you more options! It’s Bento Box season at Edo Japan!! I love getting a Bento Box as I can mix and match the dishes that go in to my choosing. But this year Edo Japan Celebrates New Bento Box Offerings which is even more exciting!! Not only do they have wonderful Teriyaki meals but they also offer new menu favourites, the Noodlefull Bowl and Chop Chop Bowl. These two new dishes are available to incorporate as the base of any Bento Box! 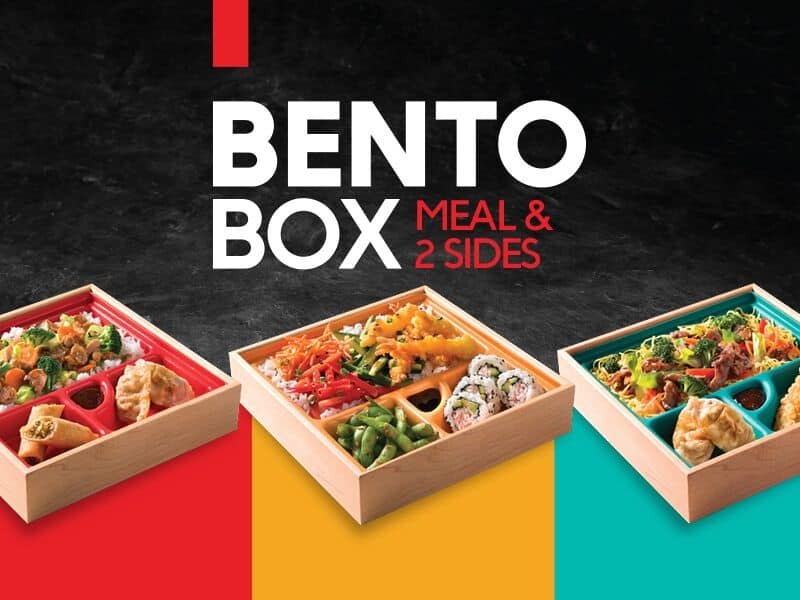 Scroll down to our giveaway so you can enter to win a $25 gift card to try out these new Bento Boxes yourself!! Tasty sides to add to any Bento also include Spring Rolls, Gyoza, California Rolls or Edamame (seas salt or sesame chili). That does make is tough to decide as they are all wonderful! Recently I tried their new delicious Chop Chop Bowl and now I can’t wait to dive into this Beef Noodlefull Bento Box. Mmmm gyozas and tempura shrimp too! With Edo’s new fresh take concept and great new dishes there is lots going on at this Alberta based franchise. Not only do they offer Tempura Shrimp as a side but you can get it as a main in their Tempura Shrimp Chop Chop Bento. 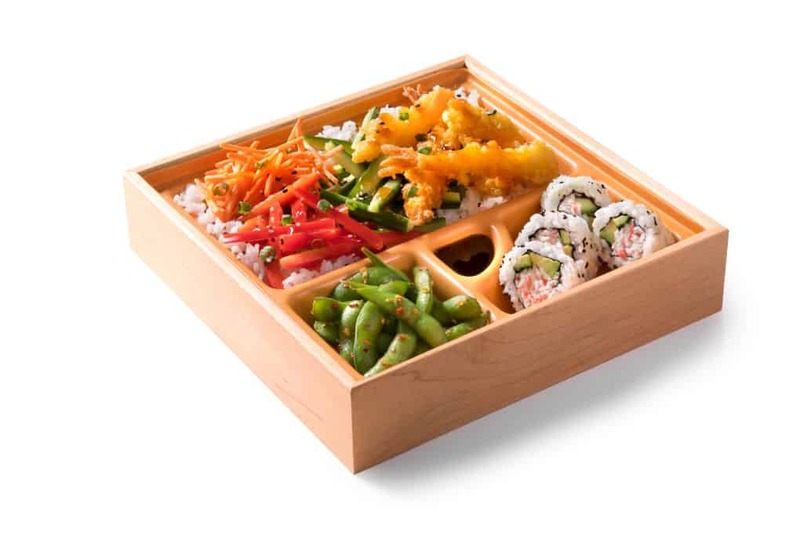 Then this Bento can be mixed and matched with Edamame and California Rolls and it makes up the perfect combination! Want to stay with something you know and love? This is Amber’s absolute favorite and I can’t disway her from it. She loves the Teriyaki Chicken with three servings of teriyaki sauce. She orders it everytime and is in heaven. She had it again this past weekend for her dinner and a movie night. Edo is a perfect restaurant for young and old. Lots of veggies make it a healthy choice for a quick meal for lunch or dinner. And for you I have a $25 gift card for Edo Japan, how exciting!! This is a quick giveaway so enter today. A winner will be chosen on April 23! Canadian residents only! Good luck everyone! I would love to try the Chop Chop Bowl with tempura shrimp… mmm! I would love to try the noodlefull box! Wow I would love to try this bowl out! Mmmmmmm! I would eat chicken teriyaki every day if I could! I would love to visit this restaurant, for sure! This looks so good! I’m going to have to try it! My family would love it! I love Sukiyaki Beef so I would get that! We love Japanese food but it is even better in a bento box! What a fun combination of menu items. All of these look extremely good. I love that they’re in bento boxes. Those are some of my favorites. They make them more fun! Fill mine up with all the veggies! I love the fresh flavors of Japanese cooking. Plus, bento boxes are just so cute! Having recently returned from Tokyo, your bento box post is making me miss one of the reasons I love Japan. Thanks so much for bringing me back for a moment from our vacation there last month. This is totally amazing! I love all those meals! Looks delish! Wish we had one of those around here. Our Japanese food choices are amazingly small (and not very good). Oh I wish there was of these around here in NJ! We would so love this! I love the idea of offering new bento boxes like this. They look delicious and sound amazing. Tempura Shrimp with a Bento that can be mixed and matched with Edamame and California Rolls. I would love teriyaki chicken with vegetables for a bento. The Beef Noodlefull Bento Box would be my choice. I would love to try the Tempura Shrimp Chop Chop Bento Box. Would like to try beef noodlefull bento box. My favourite combo is chicken and beef on rice, with California rolls and gyoza as my sides. They all sound good, I would want them all! I would have beef yakisoba, gyoza and California sushi rolls. I would love to try the chicken teriyaki one! I’d go for the Beef Noodlefull Bento Box with a side of gyoza.